Pakistan has various religious minorities. According to the 1941 census of India, there were 5.9 million non-Muslims in the provinces that today form Pakistan, mainly composed by Hindus, Christians and Sikhs. According to Western religious freedom and human rights monitoring groups, religious minorities face severe discrimination in Pakistan. We received from Aftab Alexander Mughal of Minority Concern of Pakistan the following news about the recent release of the Christian woman Asia Bibi. 8 November 2018: Asia Bibi, poor Christian woman, has been released around at 10pm last night from Women Jail in Multan, Southern Punjab, after one week of the announcement of the Supreme Court's judgment. On Wednesday morning, 31 October, the highest court of Pakistan acquitted Bibi, a married mother of five, from a blasphemy case. She was on death row and languished in a solitary confinement for a decade. According to some unconfirmed reports, the jail officials freed her after receiving the necessary documents. She reached at Multan airport under tight security and then flew to Islamabad. 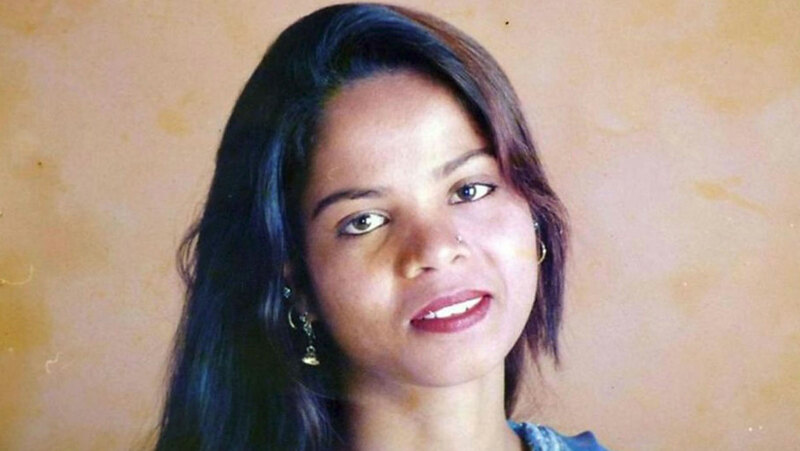 There are contradictory reports that Asia Bibi, 47, has left Pakistan for Netherlands, but it is yet to be confirmed. Her husband, Ashiq Masih, 55, already appealed to the governments of the USA, the UK and Canada for help to exit them from Pakistan because she, and her whole family were not safe in Pakistan. She cannot stay in the country because of hostile environment, Nadeem Anthony, a Christian lawyer from Lahore, told Minority Concern of Pakistan. Despite Supreme Court's acquittal orders, many Muslims still believe that she is a 'blasphemer', and they publically declared her liable to be killed, and continuously asking for her hanging. Her lawyer, Sai-ul-Mulook, 62, has already left Pakistan as he faced death threats from fanatics because defending her. He is in Netherlands now. The complainant Qari Muhammad Salaam, a Muslim cleric, has filed a review petition against the apex court's ruling. A three-member special bench of the Supreme Court, headed by Chief Justice Mian Saqib Nisar and comprising Justice Asif Saeed Khan Khosa and Justice Mazhar Alam Khan Miankhel said in their judgment, "Keeping in mind the evidence produced by the prosecution against the alleged blasphemy committed by the appellant, the prosecution has categorically failed to prove its case beyond reasonable doubt." The acquittal orders led violent protests throughout the country. Sit-in strikes were led by Tehreek-e-Labbaik Pakistan (LTP), newly formed religious party, who paralysed the country for four days. Islamists opposed the court's judgment and supported Pakistan's controversial blasphemy laws. Asia Bibi, an agriculture worker, was arrested in June 2009, after she had an argument with her Muslim co-workers by using their glass for drinking water when she was desperately thirsty in a hot weather. They strongly reacted on her act as she touched their glass. It is because many Muslims consider Christians unclean. Days after, two women approached to a local cleric and accused her for blasphemy. She was beaten and dragged to the village council, which was comprised of Muslim men. She was offered that if she converted to Islam the charges against her would be dropped. Nevertheless, she refused their proposal. Then she was pulled to the local police station and charged with blasphemy under Section 295-C of the Pakistan Penal Code, which carries on the mandatory death penalty. The law says, "Whoever by words, either spoken or written, or by visible representation or by any imputation, innuendo, or insinuation, directly or indirectly, defiles the sacred name of the Holy Prophet Muhammad (peace be upon him) shall be punished with death, or imprisonment for life, and shall also be liable to fine." Asia Bibi's case is a high-profile case, which highlighted the grave misuse of blasphemy laws in the country, and the conservative nature of the Pakistani society. Two prominent politicians, Governor Salmaan Taseer and Shahbaz Bhatti, a Christian cabinet minister, were murdered for supporting Bibi. Governor Taseer, a progressive Muslim, was murdered in 2011 by his own bodyguard, Mumtaz Qadri, for defending Bibi. Tehreek-e-Labbaik Pakistan (LTP) was formed after the death sentenced of Qadri in 2016. Maulana Khadim Rizvi formed LTP to honour Qadri and camping against any changes in blasphemy laws. Just two months later, Shahbaz Bhatti, the minister of minorities and the only Christian cabinet minister in the Pakistani government, was shot and killed by Taliban outside his home in Islamabad after he also called for changes to the blasphemy laws. During the protests against Asia Bibi's acquittal, the government seemed helpless to control the situation. The leaders of protesters used abusive language and allegations against military leadership, Supreme Court judges and Asia Bibi's lawyer. Pir Muhammad Afzal Qadri demanded the ouster of Genral Qamar Bajwa, head of Pakistan's army, and demanded to other generals' revolt against the chief of army staff. Moreover, they declared three judges of the Supreme Court, who issued the judgment, for liable to death. Strangely, no actions have been taken against those clerics who malign the political leadership and the state institutions. They used hate speech and insisted violence. To end the country-wide protests, once again, the state of Pakistan bow down to the hardliner groups by sticking a deal with them. Despite their extreme violent actions, the government tried to pacify them. Under the deal, the government accepted their demands. According to the agreement of 2 November (Friday), the government will not oppose the review petition over the acquittal of Asia Bibi. All Tehreek-e-Labbaik Pakistan (TLP) protesters will be released who were taken into custody. The government will initiate the process of placing Asia's name on the Exit Control List (ECL), so she could not leave the country. Critics slammed the government for what they called giving up against extremists, which will certainly weaken the writ of the state. Former Senate chairman Raza Rabbani criticized the agreement and said, "It is unfortunate that the state of Pakistan is under the rule of combatants." Under the blasphemy laws, these are criminal offences to insult Prophet Muhammad (PBUH), the Holy Quran and the Muslim religious personalities. "The blasphemy law (s) has been controversial as it has been used against Christians and other minorities in the Muslim-majority country," according to BBC. Originally, blasphemy laws were introduced in British India in 1860 and 1927 to promote harmony among the followers of different religions of the Sub-Continent. These laws were applicable to all religions. Pakistan adopted the same laws when she got independence in 1947. However, the present blasphemy laws were introduced in 1980s by military dictator General Zia-ul-Haq under his Islamisation police. The Section 295 –B of Pakistan penal code (blasphemy against the Holy Quran) was introduced in 1982, while Section 295-C (insult against Prophet Muhammad (PBUH)) in 1986. Since 1980s, these laws are widely misused against the Ahmadi and Christian communities. Ahmadis claim that they are Muslim but under the Constitution of Pakistan they are categories as non-Muslim minority. Under blasphemy allegations, some Ahmadis and Christians were murdered and many as still languishing in difficult circumstances in jails. It seems strange that these laws were introduced to protect the honour of Islam in an Islamic country, where Muslims are in 97 percent, and religious minorities are just 3 percent, and their majority is poor, helpless and marginalised. Since 1980s, liberal Pakistanis and human rights activists have been raising voice for the repeal of these controversial laws as people are punished without any substantive evidence. The tragedy is that even the allegations cannot be repeated in courts, so it is difficult for a defense counsel to defend his client. According to a study conducted in 1995 by Aftab Alexander Mughal and Peter Jacob, only 7 cases were registered in blasphemy laws from 1947 to 1980s in Pakistan, then Bangladesh was part of Pakistan. However, according to Daily Times, despite their tiny percentage of the population, Christians, Hindus and Ahmadis made up half of the 1,549 cases of blasphemy filed over three decades through 2017. According to Peter Jacob, the head of the Centre for Social Justice, Pakistani Christians make up only 1.5 per cent of the total population, but over a quarter (187) of the 702 blasphemy cases registered between 1990 and 2014 were against them. Pakistan is an illiberal democracy where the majority of politicians believe in Islamic ideology, and want to make Pakistan an Islamic state. Therefore, blasphemy laws have a wider support in public even political leaders defend them vigorously. Considering the socio-political situation of the state, and the track record of the present government, there is less hope that she will bring any changes into these laws to minimise their misuse. "We are standing with Article 295-C of the blasphemy law and will defend it," said Imran Khan (now the Prime Minister of Pakistan) at a gathering of Muslim leaders in Islamabad on 7 July, 2018. Furthermore, he himself used the blasphemy issue to topple down the previous government of Nawaz Sharif, and during the general elections of 2018 for the political benefit. However, the Supreme Court's latest judgment in Asia Bibi's case is certainly a positive development, which would help the liberal narrative in the country. Last update: according to the Foreign Office of Pakistan, Asia Bibi is still in Pakistan.